Sales up by almost 2,000 units, Prices up, Days on market down. ADVANTAGE SELLER once again. 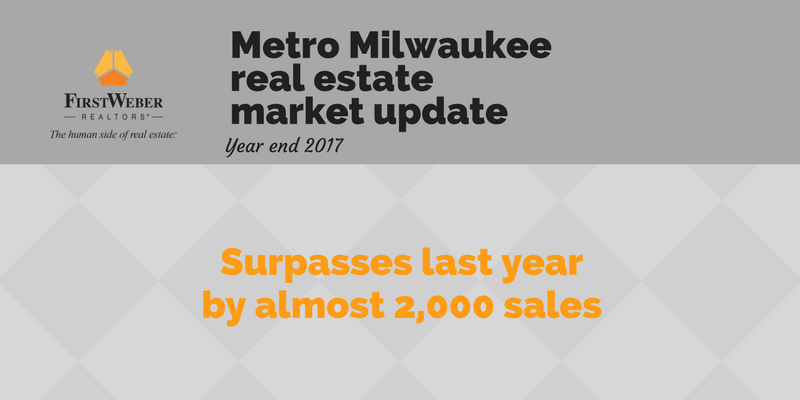 2017 Milwaukee area real estate sales closed almost 2000 more sales over a very good 2016. The average sales price continues to rise. “Days on Market” is down considerably across the metro area. Well-priced homes under $300,000 are getting snatched up quickly. You do, however, still need an agent to sell. Getting a buyer is JUST the tip of the iceberg when it comes to selling a home. And as for buyers, a buyer agent is needed now more than ever! Days on market are now at 50 days, down 25% compared to last year. Days on market are now at 49 days, down 31% compared to last year. Days on market are now at 59 days, down 28% compared to last year.